As a Business School we believe it’s vital to work closely with organisations to help improve students’ employability. 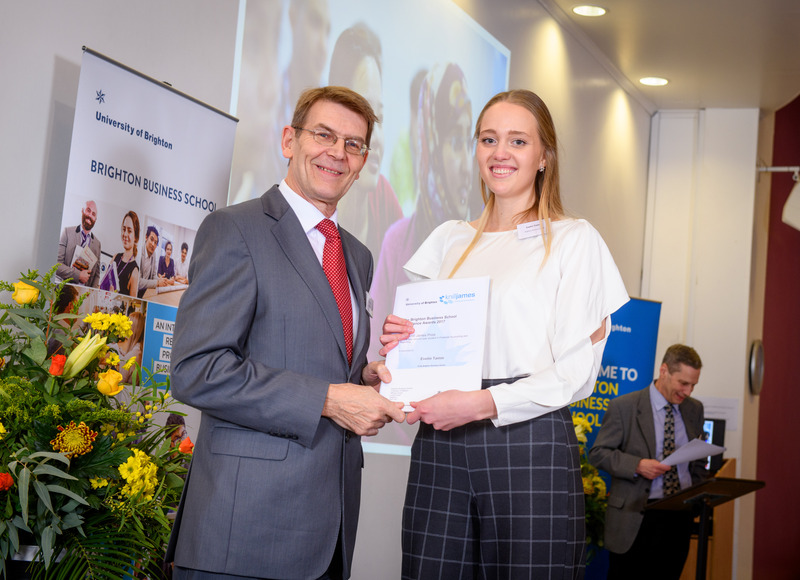 Each year we hold two annual awards ceremonies, sponsored by a number of our business partners, the summer Prizegiving Ceremony and the autumn Excellence Awards Ceremony. We met with one of our sponsors from our Excellence Awards event this week, Nick Rawson, a partner at Knill James. We spoke with Nick to find out more about their relationship with our school and why it’s important to bridge the academic and professional worlds. Why is it important that students are recognised by professional organisations such as Knill James for their achievements? 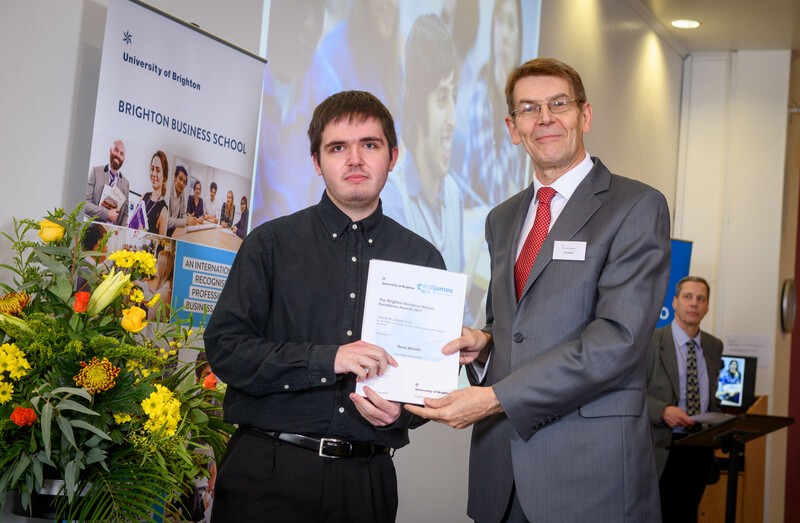 Toby Read, winner of the Kill James sponsored prize for the best first year student in Accounting and Finance BSc(Hons). Pictured with Head of School, Professor Jonathan Doust. Why is it important that students have access to professional organisations? How do accredited courses, like Brighton’s, help prepare students for their future careers? Can you give some examples of how you have been working with Brighton students? Knill James recently sponsored three prizes at our Excellence Awards; the prize for the best first year student in Accounting and Finance BSc(Hons); the prize for best second year student in Financial Accounting and Reporting; and the prize for the best second year student in Management Accounting Systems. What tips/advice would you give to prospective students about studying Accounting & Finance at University of Brighton? Benz Walshe, winner of the Kill James sponsored prize for the best second year student in Management Accounting Systems. Pictured with Head of School, Jonathan Doust. Does Knill James have a graduate recruitment programme? “Absolutely yes! Our graduates study with either the Institute of Chartered Accountants (ACA, ICEAW) or the Association of Chartered Certified Accountants (ACCA). We provide invaluable support around their studies as well as some real ‘hands on’ experience working within highly experienced, expert teams. You can find out more about Knill James’ careers on their website. 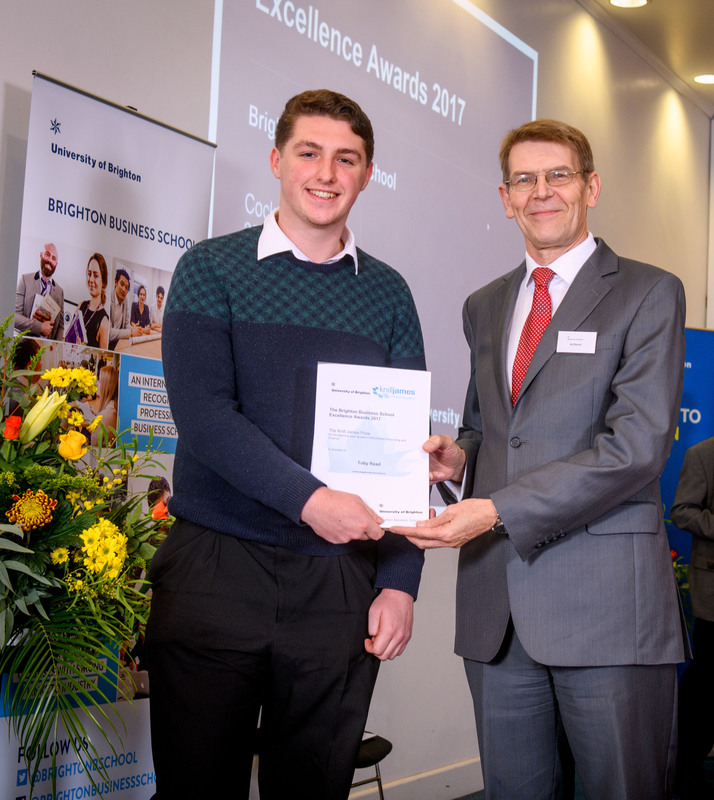 Nick Rawson, a Partner at Knill James, is Brighton University Alumni and therefore enthusiastically supports burgeoning talent from the school in the field of Finance and Accountancy. Nick has been a Partner at Knill James for 15 years and heads up their Tax Advisory department. This department provides tax and business advice, as well as un-rivalled personal attention, to business owners and small to medium-sized enterprises (SMEs). 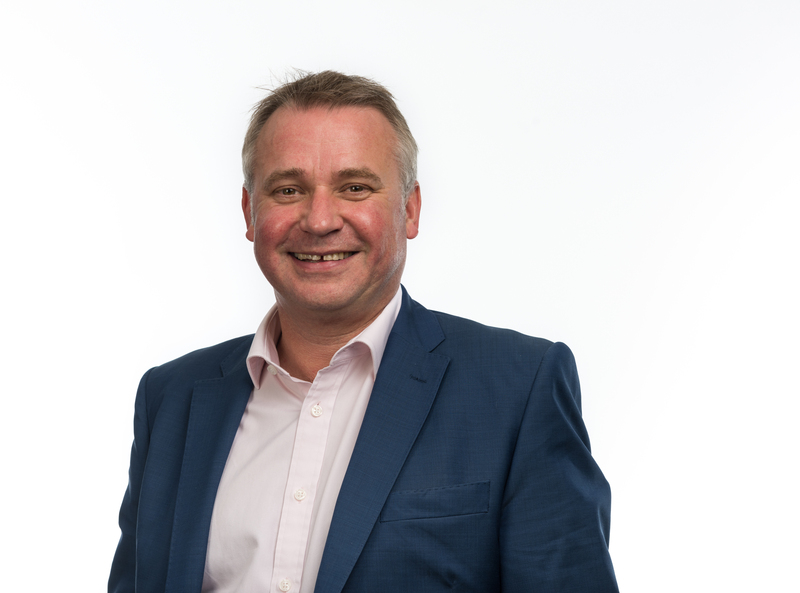 Nick has experience of providing Audit and Due Diligence services as well as specialist business planning advice to clients from a diverse ranges of sectors. Knill James are a well-established and highly respected firm of accountants based locally in Lewes, providing services to businesses in London, Brighton and throughout the South East. Our experienced teams provide expert advice on key areas; including audit and assurance, business services, company tax, corporate finance, wealth management, tax planning, business strategy and advisory, management accounts, bookkeeping, outsourcing and alternative divorce support. Tagged Accounting, Accounting and Finance, alumni, awards, Business, employment, Industry, Undergraduate. Bookmark the permalink.